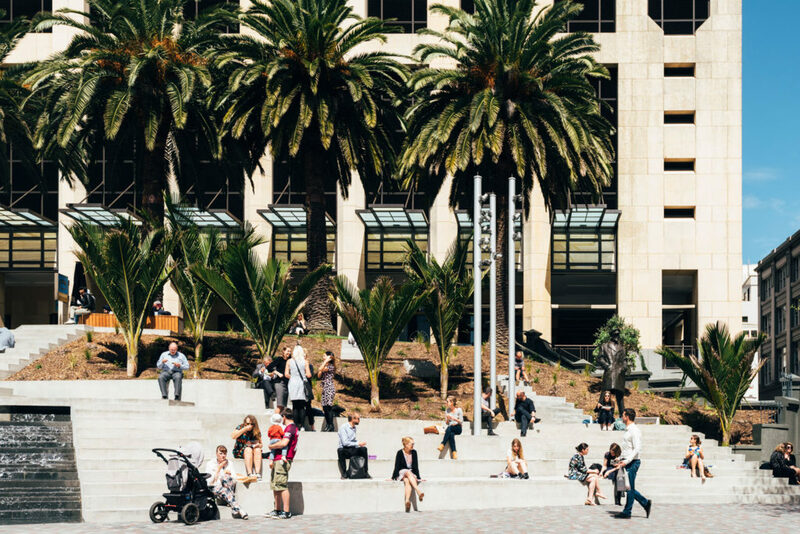 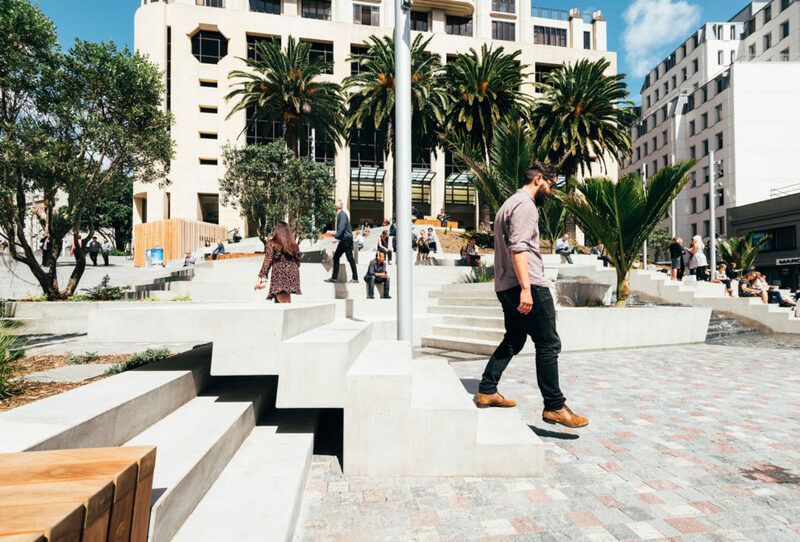 Located within the ‘engine-room’ of Auckland city, Freyberg Square sits on a north facing slope on the toe of an historic volcano. 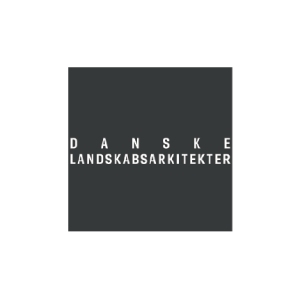 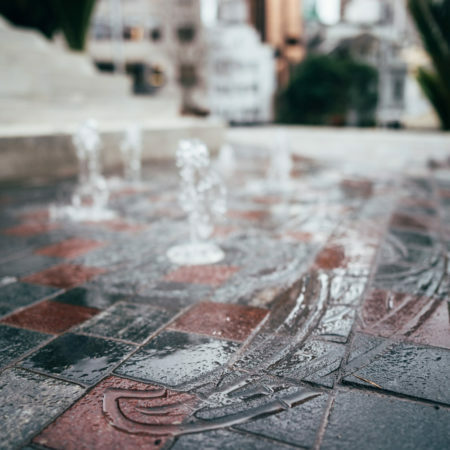 With fabulous aspect for sun, and shelter from the prevailing south-west wind, it is a popular destination for locals and visitors, adults and children, residents and workers to take quiet refuge from the hustle and bustle of the city centre. 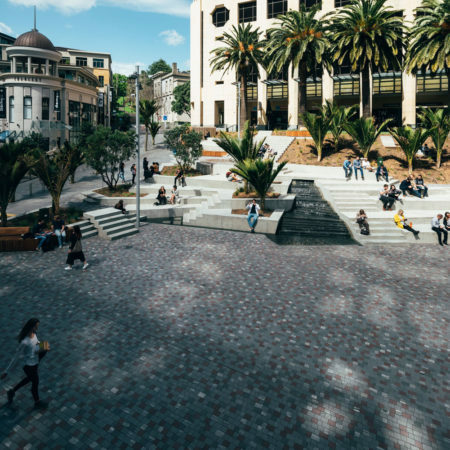 First carved out as a public space in the 1960s, the plaza received a major, military-themed, upgrade in the 1990s that had since become very tired; the many different paving materials were failing, and the closed edges attracted antisocial behaviour. 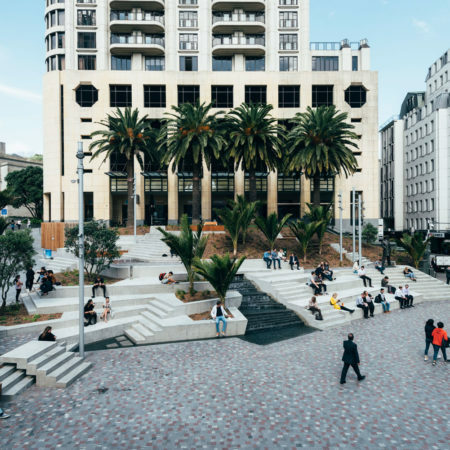 This was holding the city back from its goal of becoming a walkable city with a high quality network of street, lanes and urban spaces. 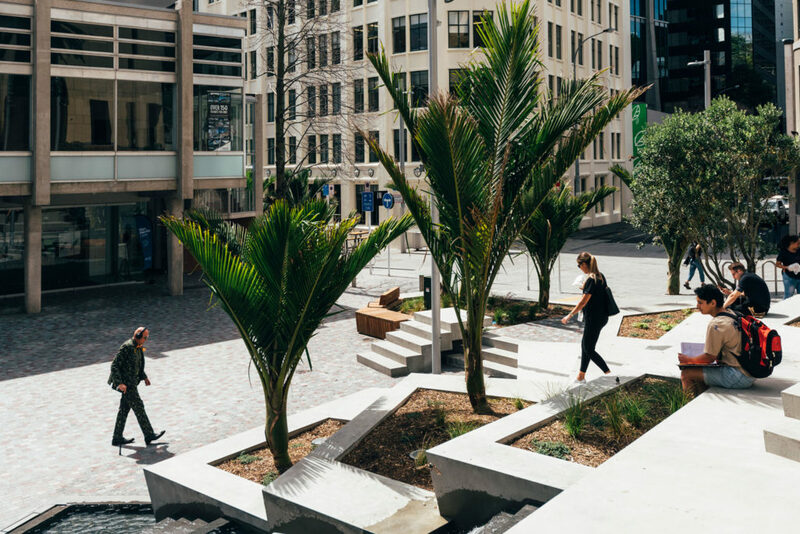 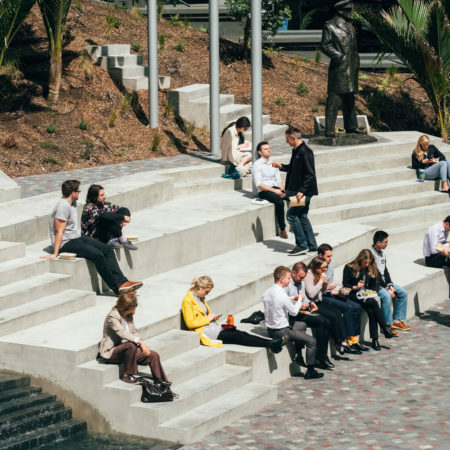 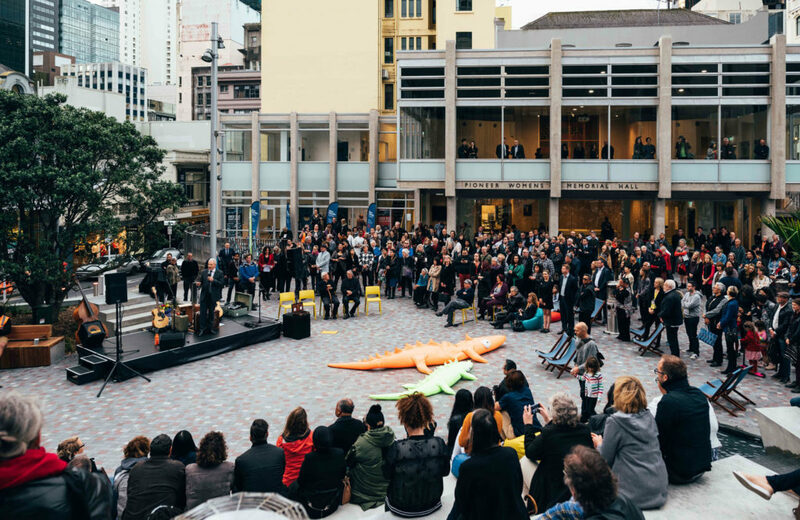 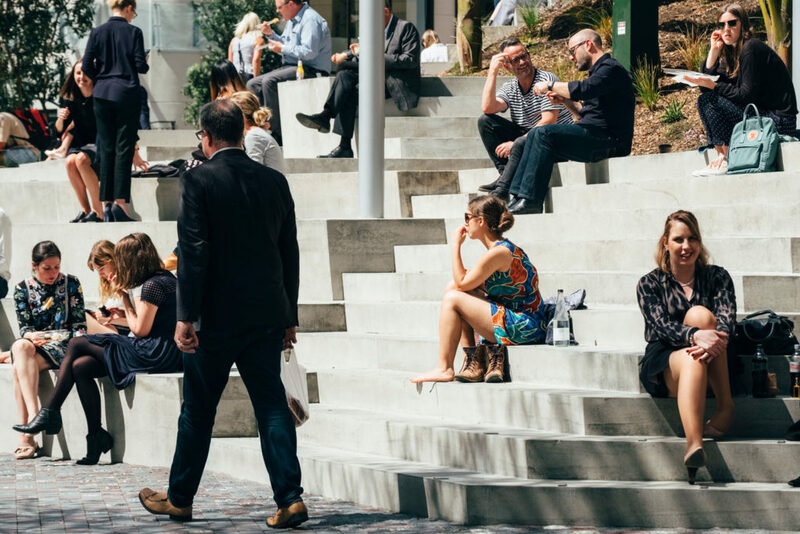 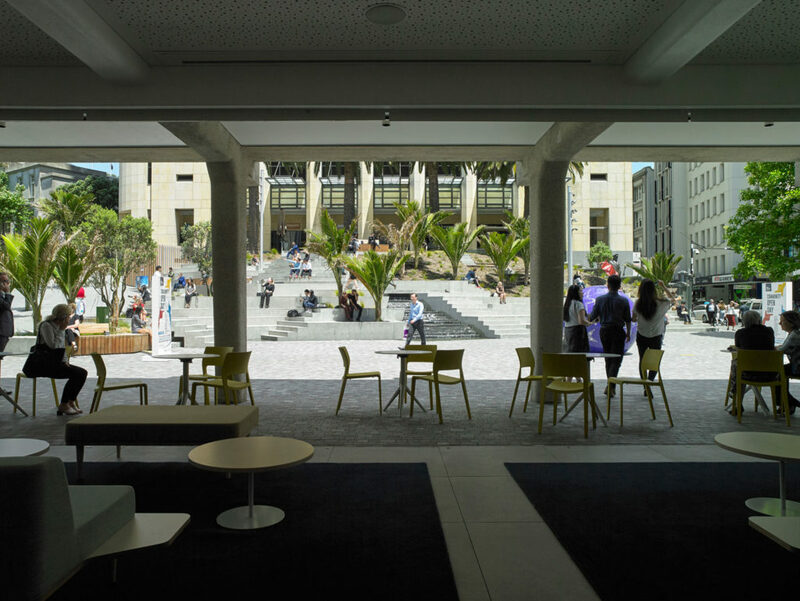 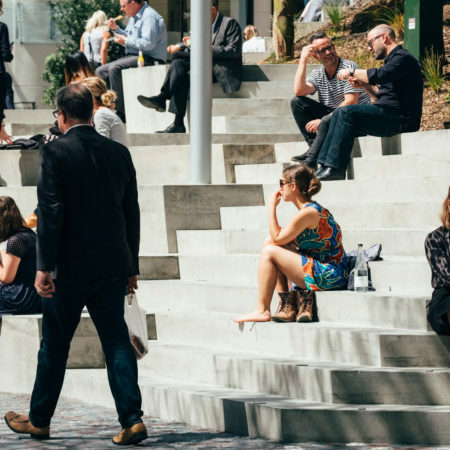 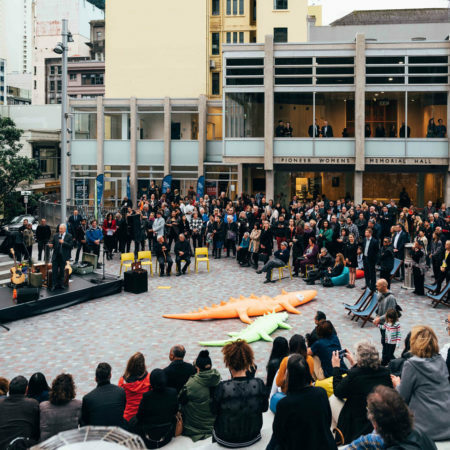 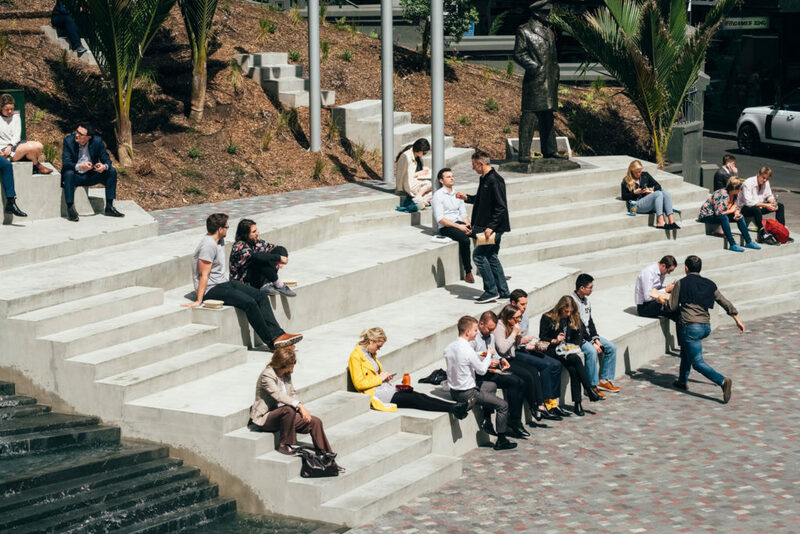 The new Freyberg Place explores the overlaps between public art and architecture; it offers an open invitation for Aucklanders to inhabit, occupy and claim it for themselves. 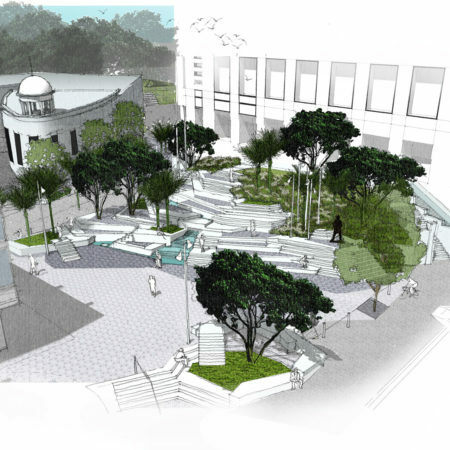 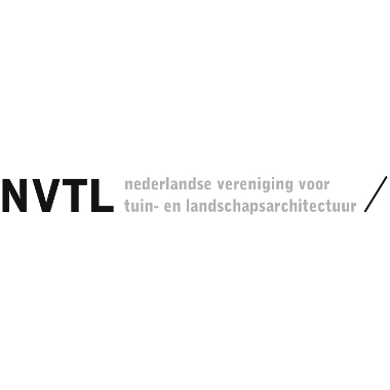 The upgrade engages with and celebrates its environment, geology and history. 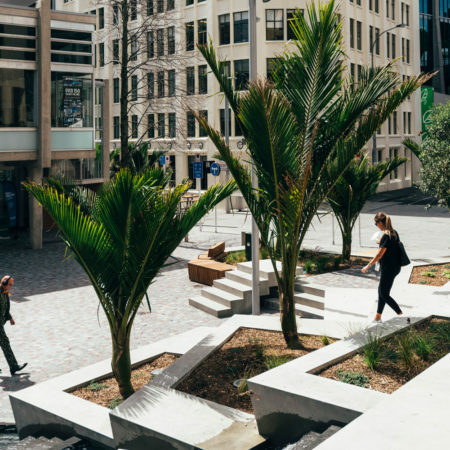 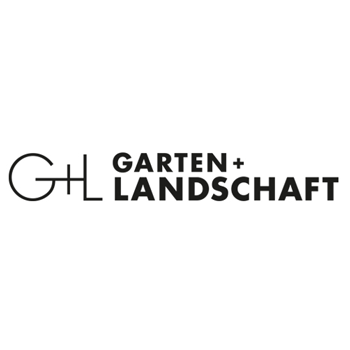 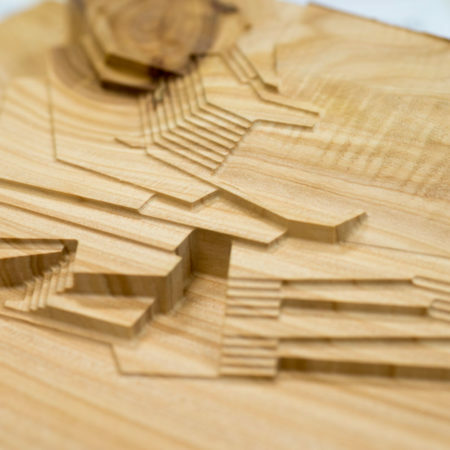 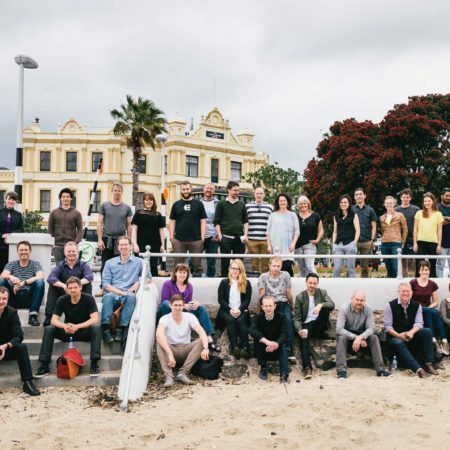 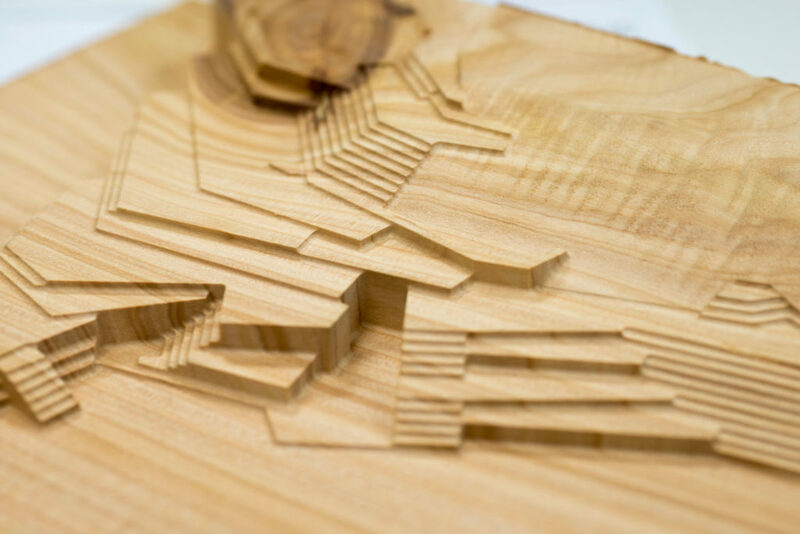 Landscape architects Isthmus Group worked with renowned New Zealand artist John Reynolds to generate the narrative concept ‘one hundred and eighty-nine steps’. 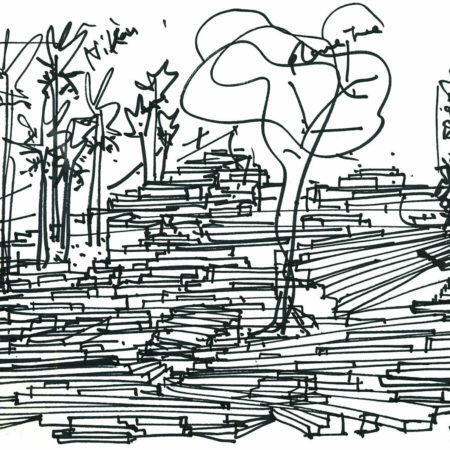 Picking up on the historic steps that used to lead up to a church, Reynolds sketched a cacophony of stairs – myriad, intersecting flights and terraces. 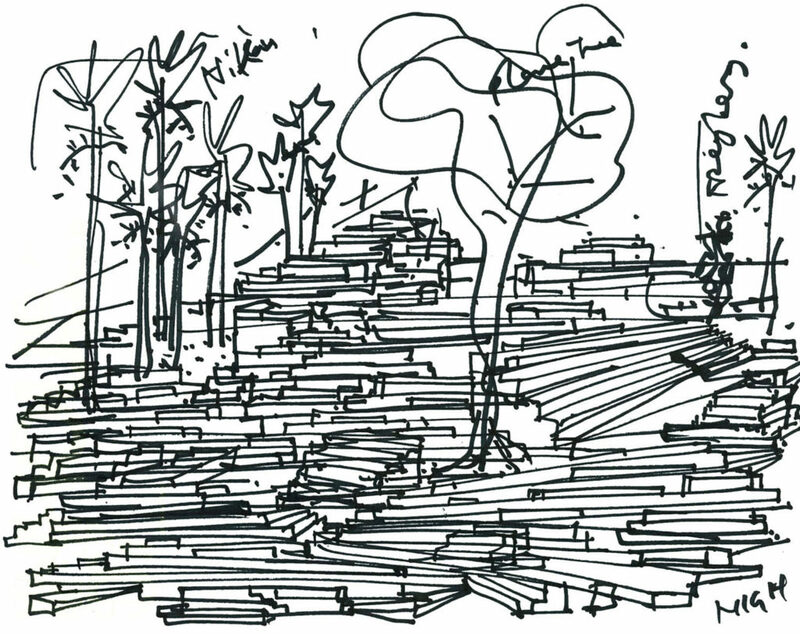 The simple flight of stairs was repeated, amplified and magnified into a ‘volcanic flow’. 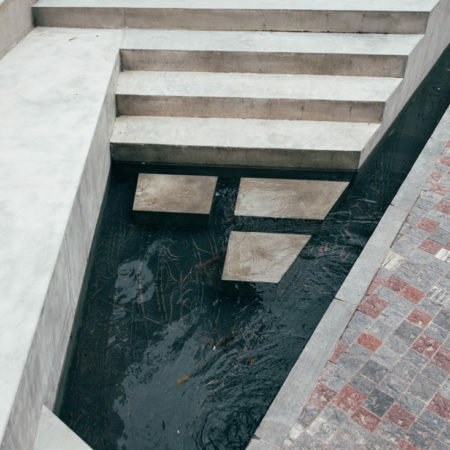 Here the steps were designed not to get from A to B, but to inhabit. 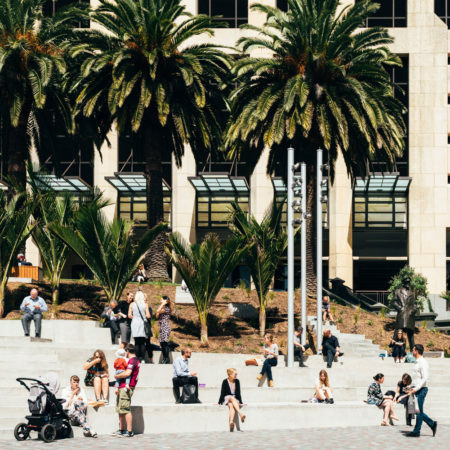 The Square provides an opportunity for individuals and groups to gather in the sun or sheltered in the dappled shade of native trees. 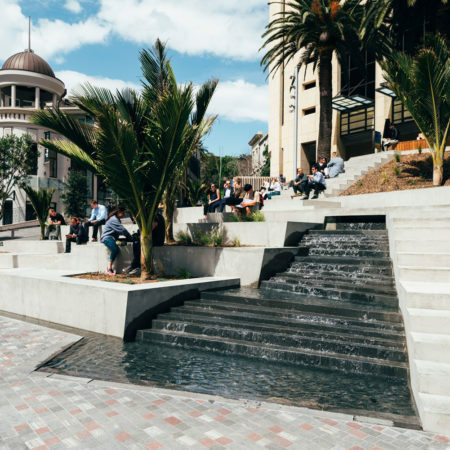 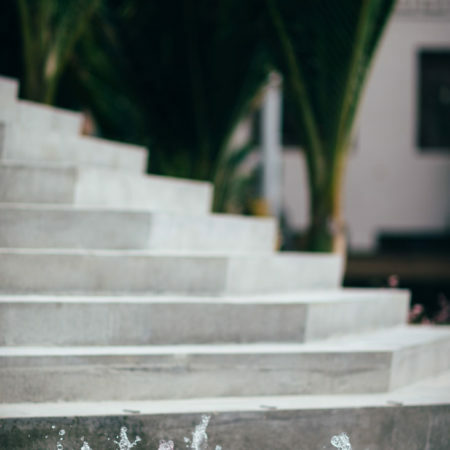 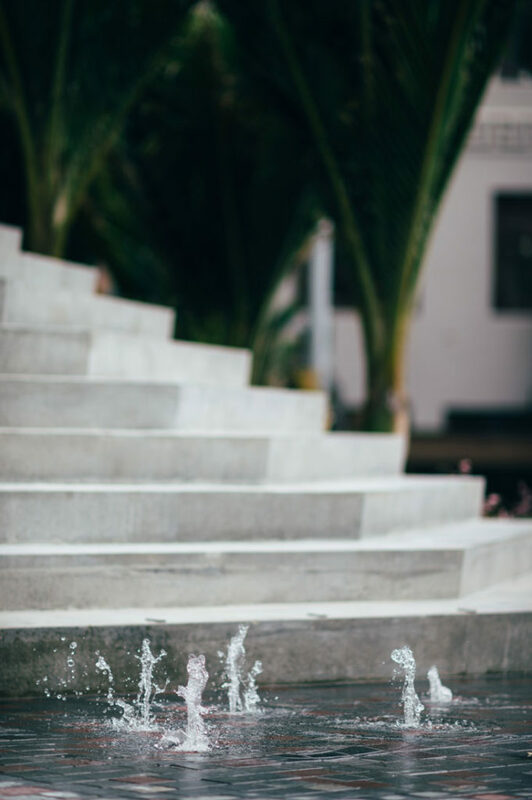 As the stairs do not perform a function as access to a building, the entire feature has been designated as an artwork which avoids the design code requirements such as handrails and tactile paving strips. 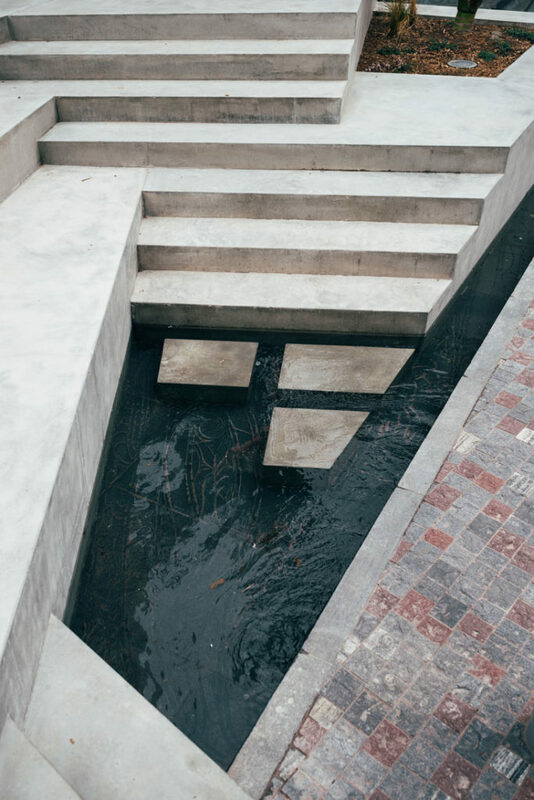 Further drama is brought to the flat paved area with dislocated steps leading to cantilevered platforms, or “speakers steps”. 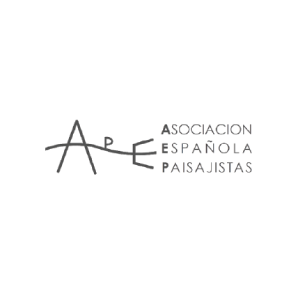 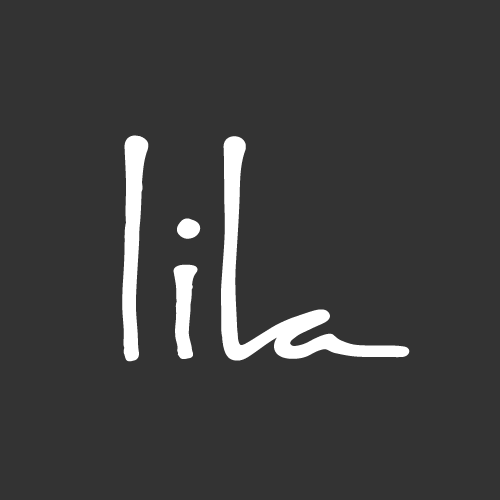 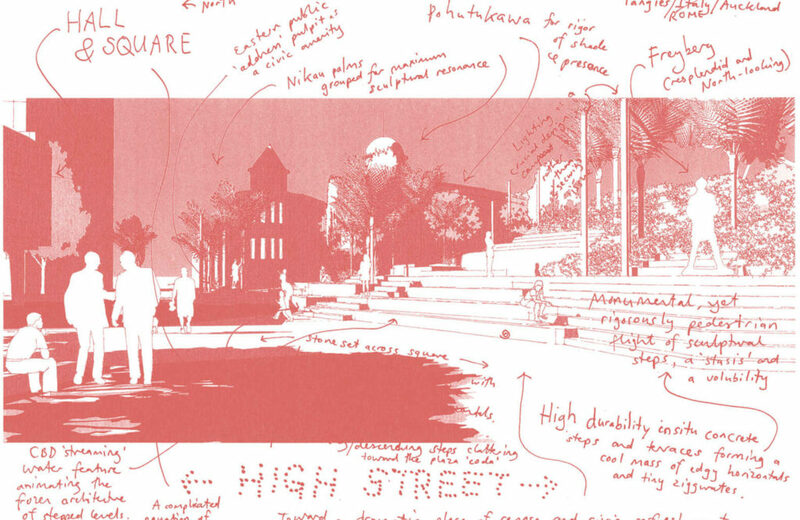 John Reynolds characterises his four-year involvement in the project as an attempt to develop an artwork that functions for locals and visitors alike. 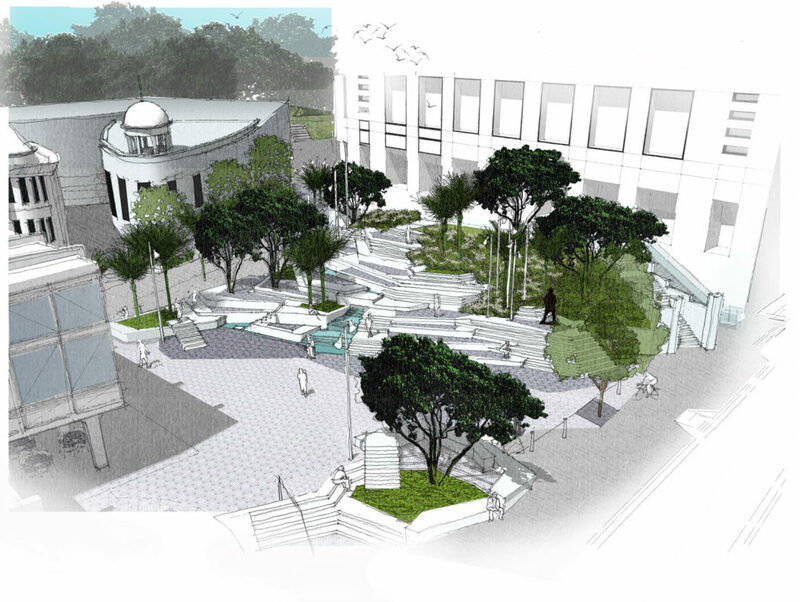 “It’s perhaps a mirage rather than a monument,” he says. 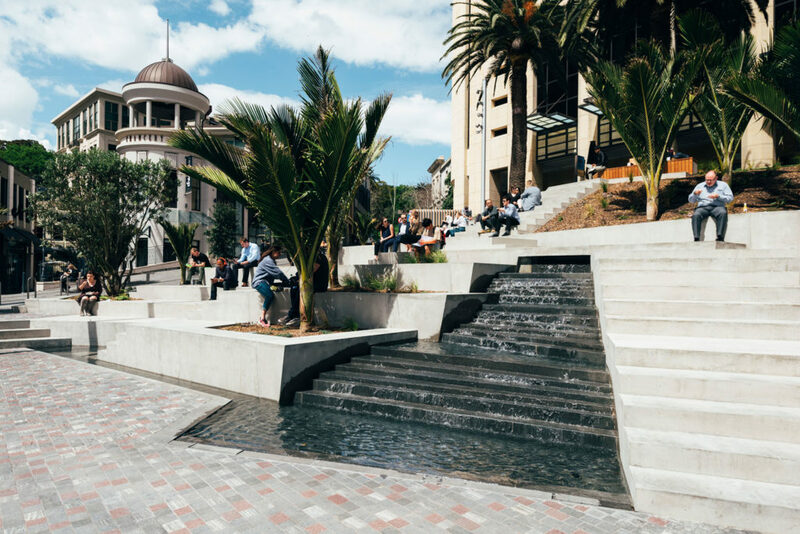 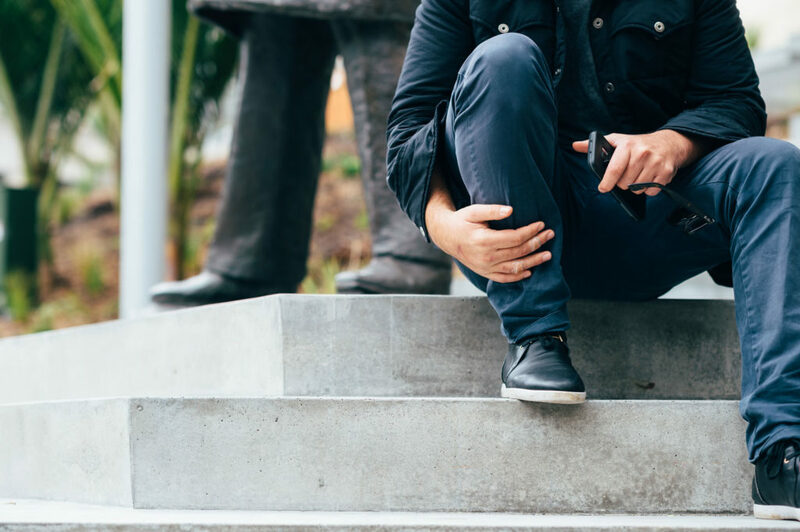 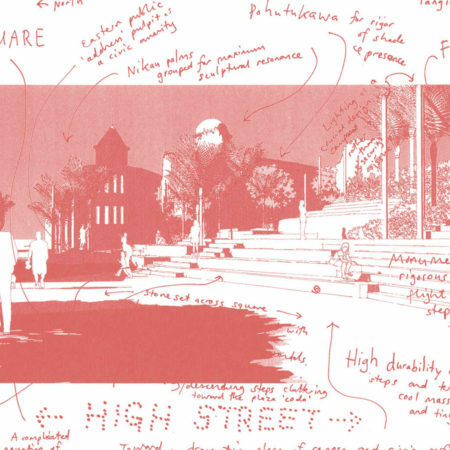 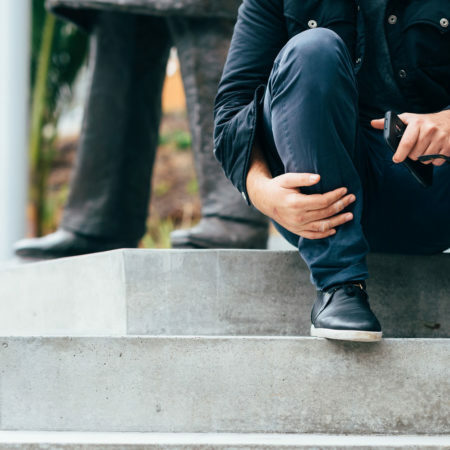 “Not a plonked-down bronze sculpture but a participatory public installation.” The massed concrete steps are an attempt to create a civic artwork in the heart of the city by blending the artists vision with the technical skills of the urban designer and landscape architect. 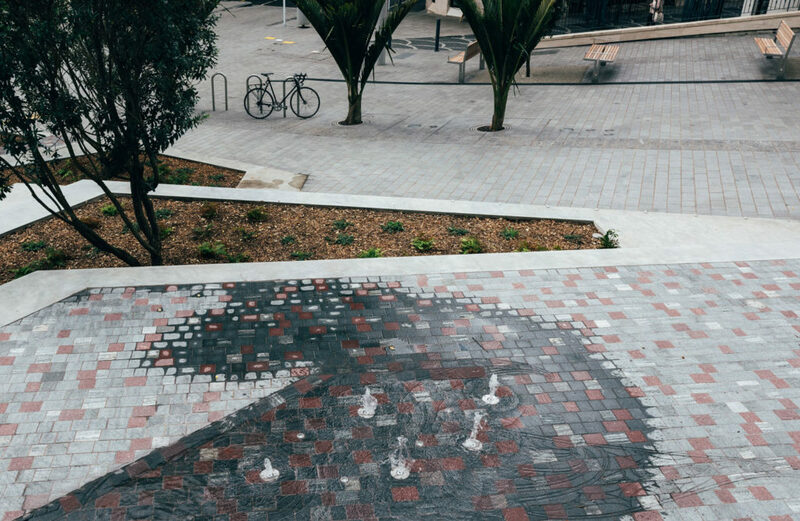 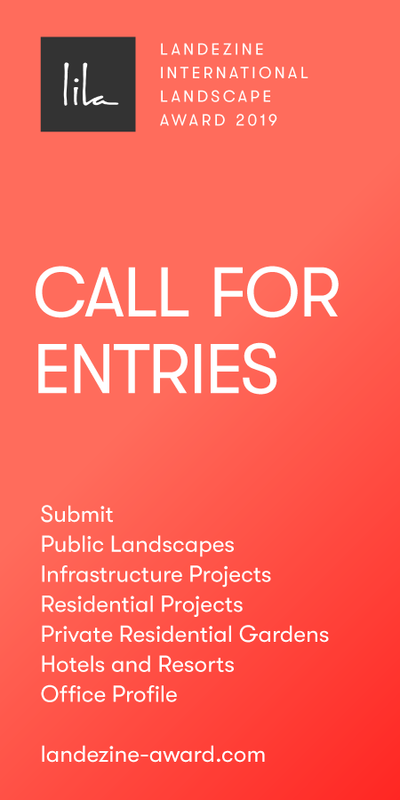 As a result of mana whenua consultation during early design phases (working with the ‘people of the land’, the local Māori), a clear and meaningful strategy around stormwater management, materials and planting was developed that acknowledges and expresses their historic relationship with the area. 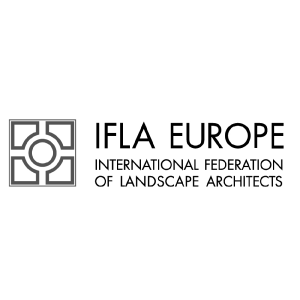 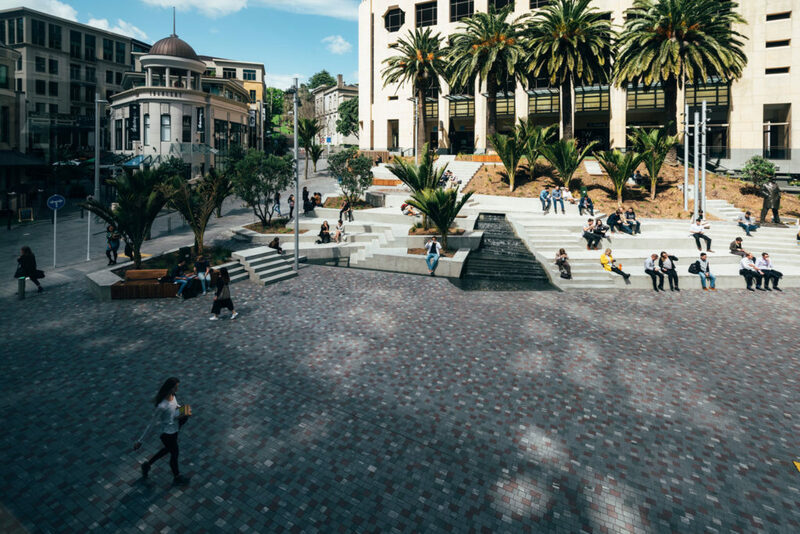 The in-situ concrete terraces and steps are interspersed with a palette of hardy native trees, shrubs and groundcover species that were selected to reflect the ecology of the site as it was 200 years ago, prior to the arrival of Europeans. 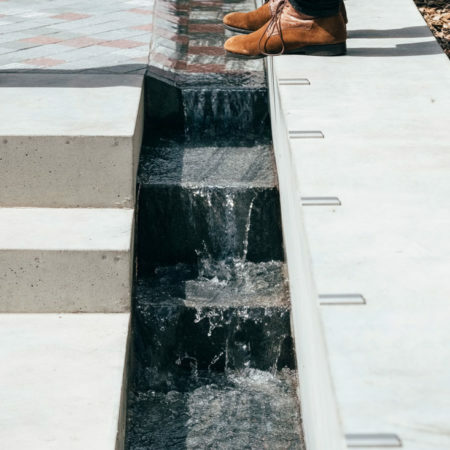 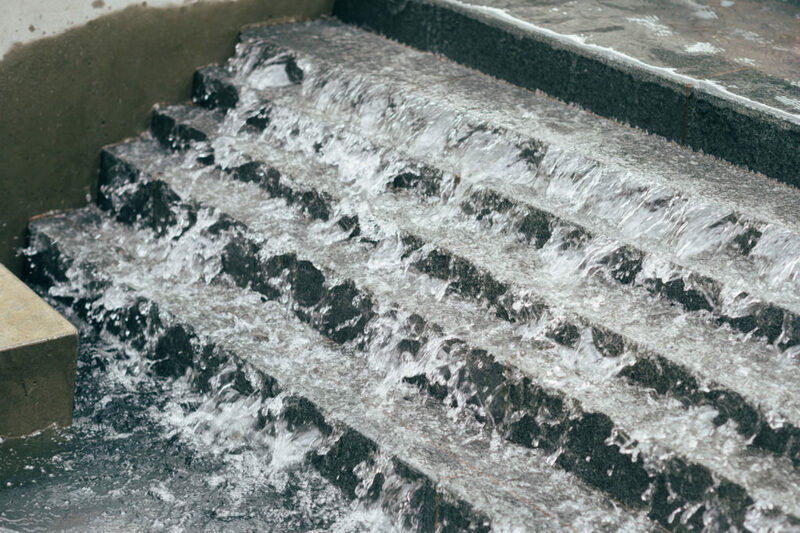 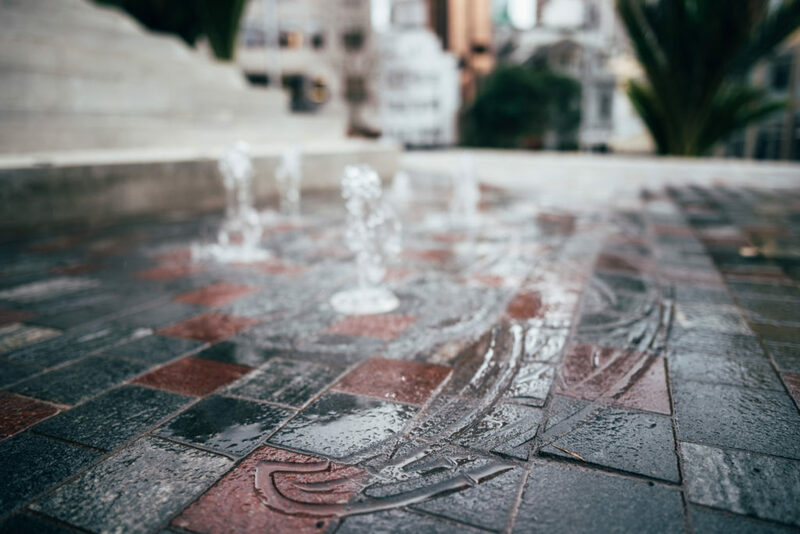 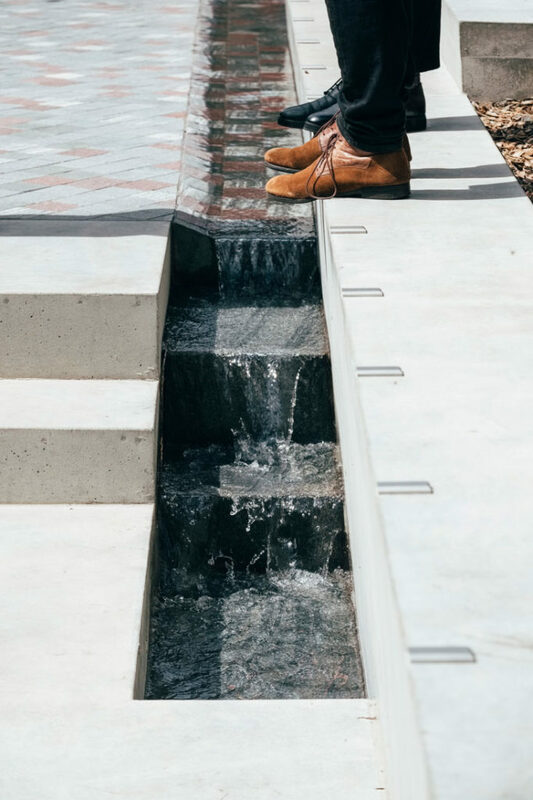 In addition, a water feature meanders through the stepped terraces; referencing a stream that once flowed near the site, the water feature emerges from the ground in a cluster of jets and descends playfully from the upper reaches of the steps to the level plaza area. 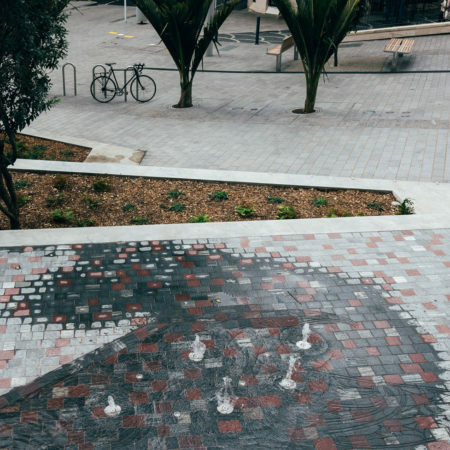 On its base is carved a ‘tattoo’, an artwork by a well-known indigenous Ngāti Whātua Ōrākei artist. 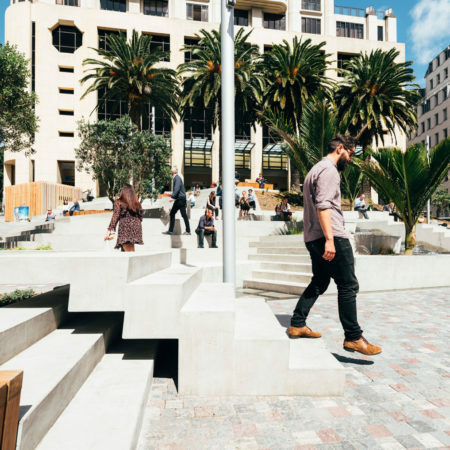 The horizontality of the step modules is balanced with strong vertical elements, nīkau palms and light poles, uplifting notes that tie back to the expressed concrete columns of the refurbished Ellen Melville Centre. 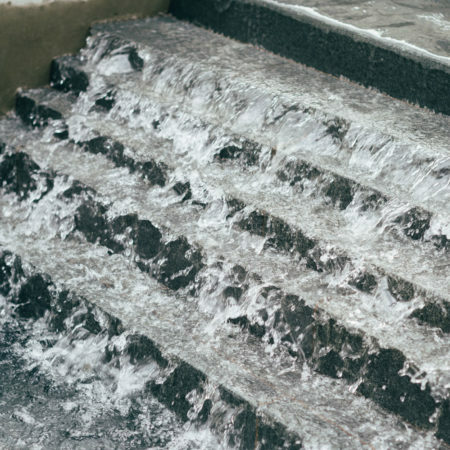 Within the rhythm of elements, the stairs ebb and flow, protruding pointedly out of the landscape from some angles; nestling in from others. 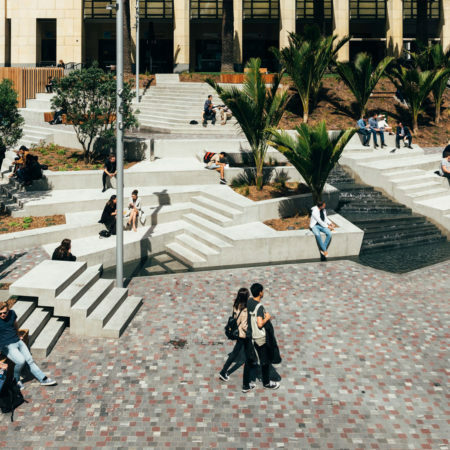 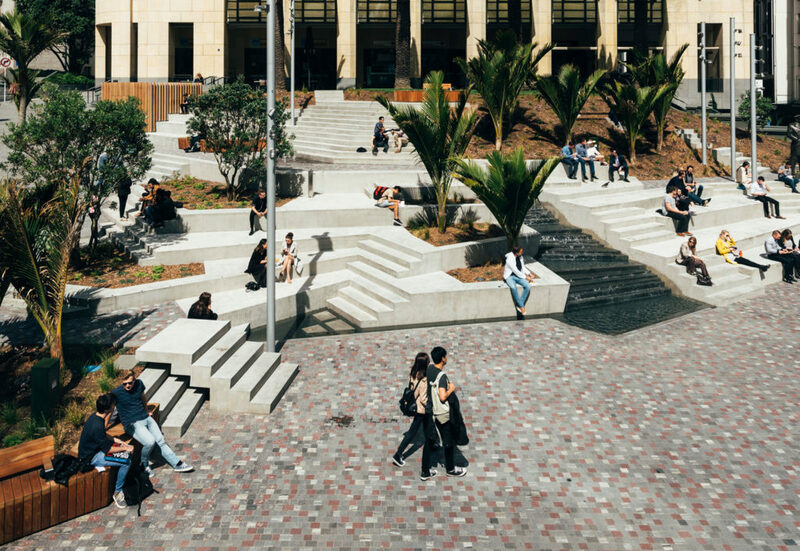 From above, light diffused by groves of pōhutukawa trees and nīkau palms adds to the drama by drawing intricate and dramatic shadows across the steps. 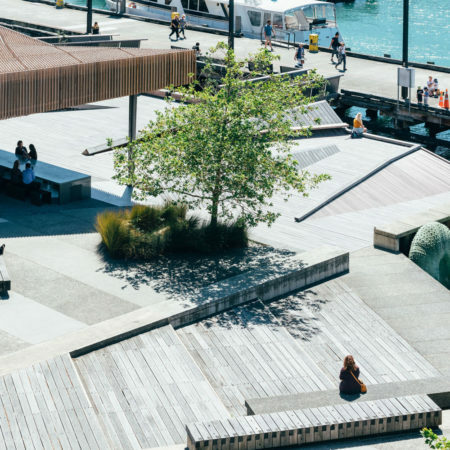 A Unique Place That Aucklanders Have Claimed For Themselves. 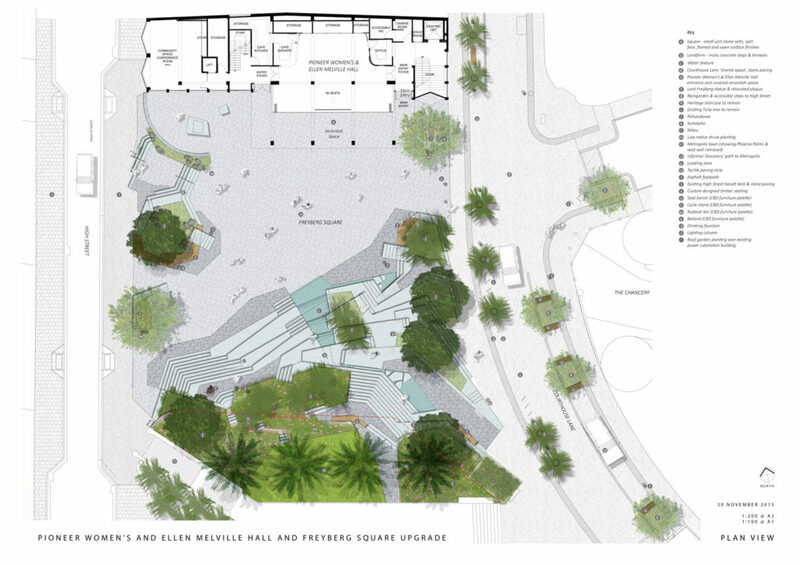 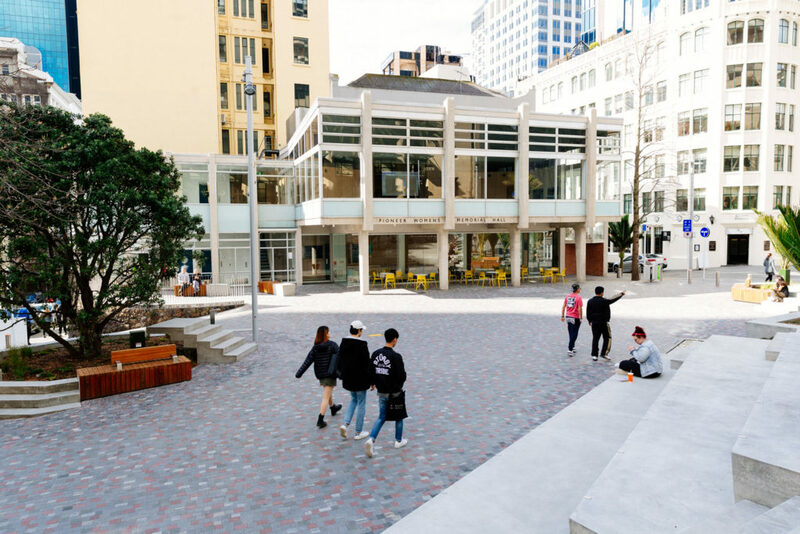 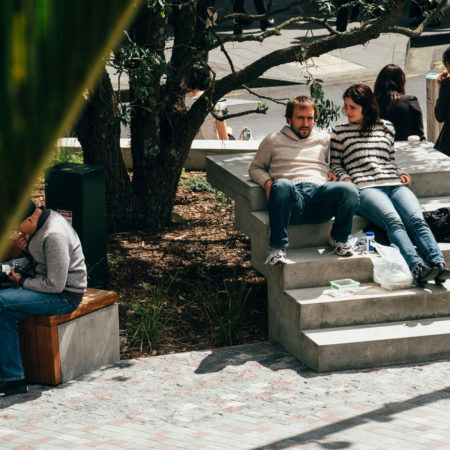 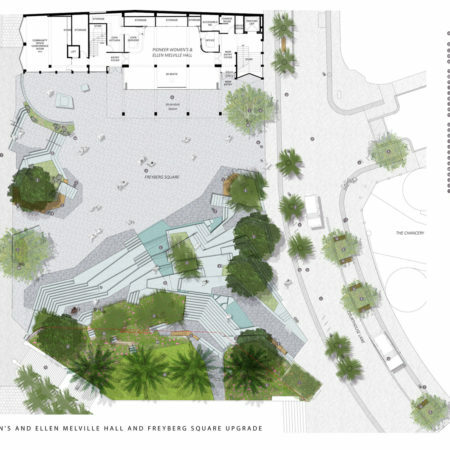 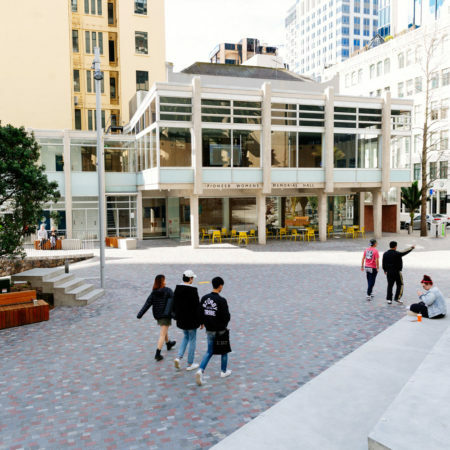 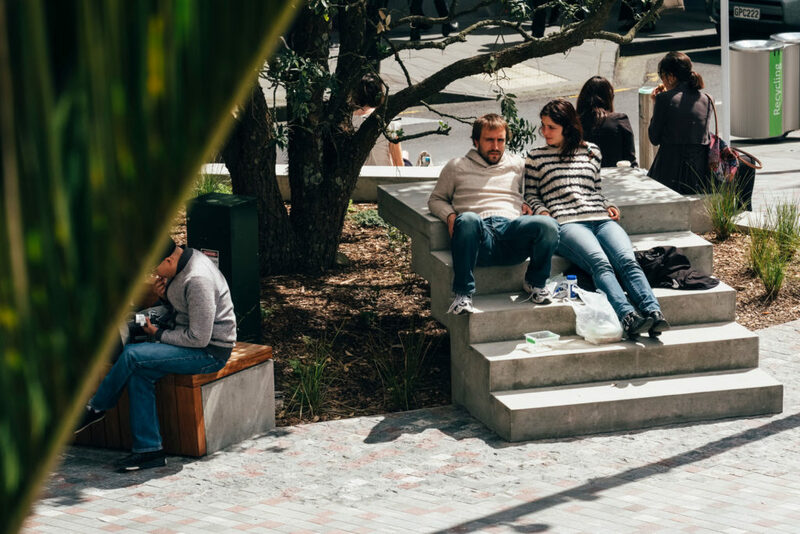 The upgrade of Freyberg Place (hand-in-hand with the transformation of the adjacent Pioneer Women’s & Ellen Melville Community hall) delivers on aspirations for a vibrant, accessible and liveable city for the people of Auckland. 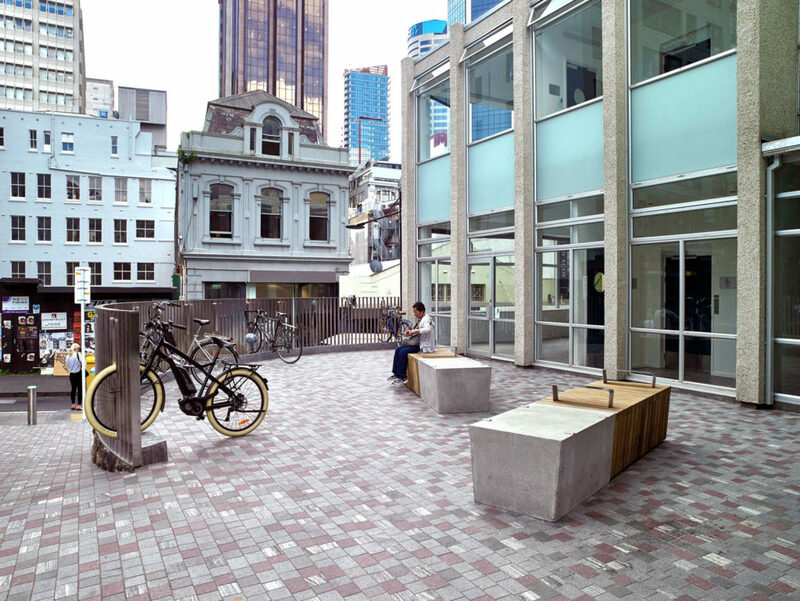 The integration of the building with open space elevates a potentially great inner-city space into a premier square infused with art, landscape and building. 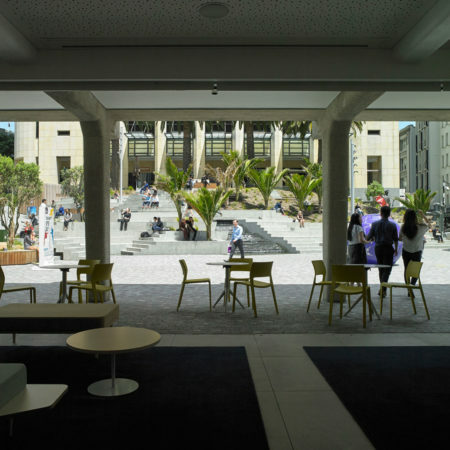 Better integration with the Hall has been made through the creation of a sheltered veranda space at ground level, into which the square extends. 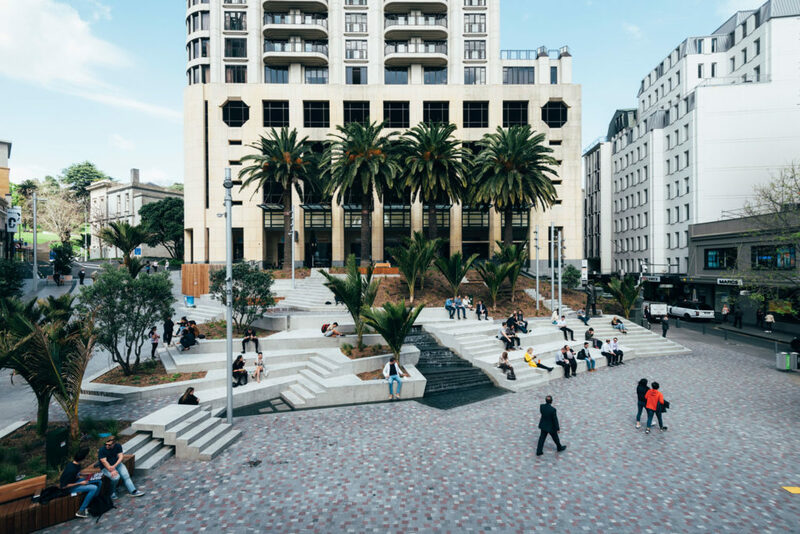 After a hard-fought battle between retailers, civic officials and the design team, the road that once passed through the square has been closed, keeping cars out and giving the space over to pedestrians. 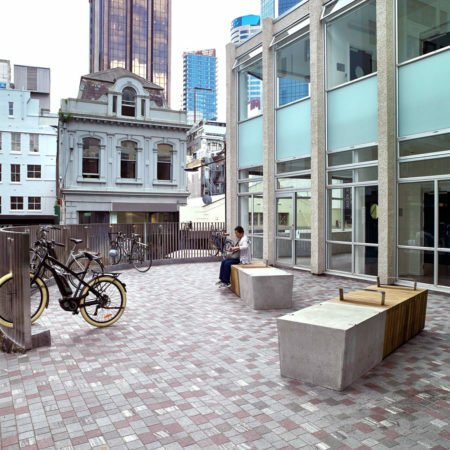 Project location: Freyberg Place, Auckland, 1141, New Zealand.